The second season premiere of Legion is fast approaching, and said new season will bring on a new actor to play the series' powerful psychic villain, the Shadow King. 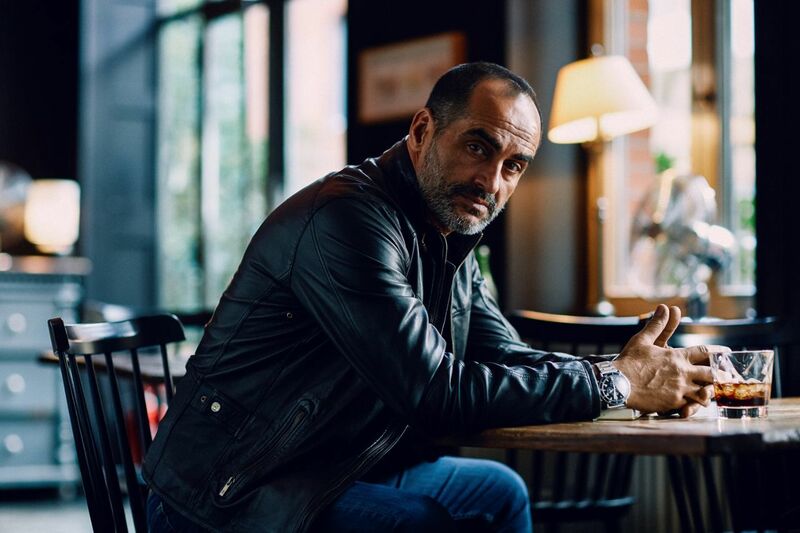 Navid Negahban will play Ahmahl Farouk, the mutant who infested the mind of powerful mutant David Haller (Dan Stevens), a role that originally went to Wonder Woman actor Saïd Taghmaoui. ComicBook.com spoke to Negahban about joining Legion, playing Farouk, and working with the show's cast to get caught up to speed. You end up playing The Shadow King in Legion Season Two due to a shuffle in the original casting. Can you tell me a bit about how you ended up in the role? Navid Negahban: Well, I was in London. I just finished Aladdin, and then I got a call from my team telling me that Noah [Hawley] wanted to talk to me, and we had the Skype call, and he told me a little bit about the character and about the project and then he asked me, "How soon can you be here?" "Well, I just wrapped a project and I'm open and available." And then I jumped on the computer, I watched the show. I really liked it. And then I flew back on Sunday, and I went to work on Monday. So [laughs] everything was kind of, it was like a whirlwind. Did you have to go back and reshoot a lot of material, or were you able to pick up where the rest of the cast was at? No, we had to shoot I think about seven episodes. Just on my character on the scenes that the character had. And, I never forget the day one that I arrived I went into the production office and they handed me nine scripts. "Also, we are shooting the eighth, and this is the nine just for you to look at. And it is not done yet, but we are shooting the other seven." So it was crazy, and Bill Irwin saw me walking on the lot with nine scripts in the hand and was so sweet, he came up to me and said, "Do you have anyone to run lines with you? Do you need help? I'm available, I have time." And then Aubrey [Plaza] was very sweet. Aubrey jumped in. She kind of created a skeleton for a character on the first season. And then with Dan [Stevens]. And both of them, they were very helpful. They came and they kept feeding me information. "OK, this is what the scene is. This is what's happening. This is what's going on." And the whole team, they really took me in. It was amazing. Can you tell me anything about your personal take on The Shadow King? I think the journey and the life of the character have been very fascinating. He has been around since the beginning of creation or something. This is my understanding of the character. And, the lives he's lived, the journeys that he's had. And to just capture the whole thing and embody the journey, that was a challenge of its own. And, I don't know. You're asking me to judge my work, and I don't know how to do that. I think it's for you guys to decide what I did. And especially, I'm sure that world, the comic world, they have their own understanding. I just hope that I was able to do justice to this character because the character that’s been created, Shadow King, is not just the comic character in the comic role, he's a real character. Did you go back to the original comics for inspiration on The Shadow King, or did you more try to root it Noah Hawley’s world? I think Noah's world is fascinating and the way that he's seeing the world and the way that he's capturing and the way that he's incorporating the present time into this comic world. And how each character will present a layer of us and how he regularly asks questions about us, and for us to discover ourselves as the audience. I think that's, all of this is very fascinating. That was a world that I was introduced to and I like to stay there. I like to figure it out. His mind is fascinating, the way that he is describing, the way that he's creating. Him and Nathaniel [Halpern], they both are very open-minded, very aware of current events and the things that are happening. And these characters are not just comic characters, they are making you ask yourself, "Who am I? What am I doing here? What am I supposed to be doing? And what can I change?" I think that's what the show should be. Instead of numbing you, a TV show should be waking you up to look deeper and deeper inside yourself and see what you can discover. And I think that's what Noah and Nathaniel are doing through the show. So, on its own, it's a fascinating world, it's multilayered. And I think it's enough to discover that before you jump into another world and you're trying to understand something else. I don't know. I mean, that's the way that I see it. The Shadow King is somewhat unique as a character played by multiple actors at the same time on the same TV show. How did you work with Aubrey Plaza like in trying to establish the character? She was very helpful. She was very generous by allowing me to see her journey and her discovery for Shadow King. And that gave me some basis, especially because Aubrey and Dan, they've already been possessed by Shadow King, so the movements they've created meant basically Shadow King has created in them, so by me watching them and understanding and asking them, questioning and discovering their journey helped me to understand the motives and what's behind Ahmal Farouk, the Shadow King. So, the guys were very generous and very helpful. I don't think that I would have been able to catch up the way that I did, and I would not have been able to discover the layers that I discovered if it wasn't because of the help of the rest of the cast and Noah and Nathaniel. They were on the set and we were working on the lines so that we were discovering the lines. We were discovering where it is coming from, where is it going, why is he saying what he's saying. So I think there will be tons of clues and tons of puzzle pieces. And at the end the audience will be able to create this beautiful, beautiful, amazing painting, puzzle, putting it together, putting all the elements and all the pieces together. Is there anything you can say about your physical presence on the show? Are there prosthetics involved? That remains to be seen. [laughs] You know, you don't want to interview the third Shadow King, do you? You are asking me questions that could cost me. Legion returns to FX on April 3rd.